Why would you want a custom park position? For me this is very important. In order for my roof to close I need the telescope to be in a horizontal position, so taking up minimal height. If I could only use the usual home position then my roof would not shut....... It's as simple as that! It can also be used for flats - Say for example you have your flats panels on your observatory wall, you can set the park position so that you will be able to do flats easily and without fuss. The generic home position of the mount is weights pointing towards the floor and the scope pointing north. 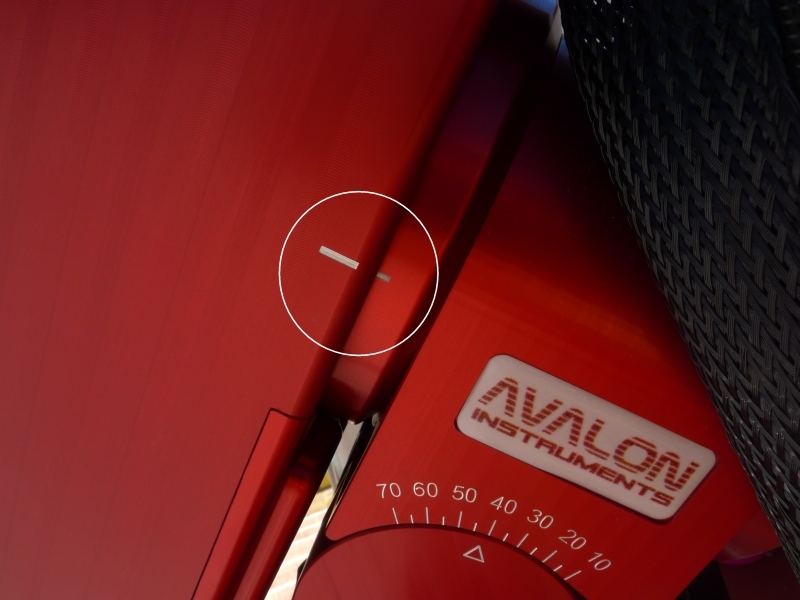 There are marks on the Linear Fast reverse to ensure that you can put the mount to an accurate home position should you want. I am going to show you how to set a park position that is different to the home position so that you can have your equipment positioned how you need it. It is worth mentioning at this stage that the mount will always park to this position as well at the end of an imaging sequence, whereas other software I have used this has not been possible. For me this is a BIG advantage. 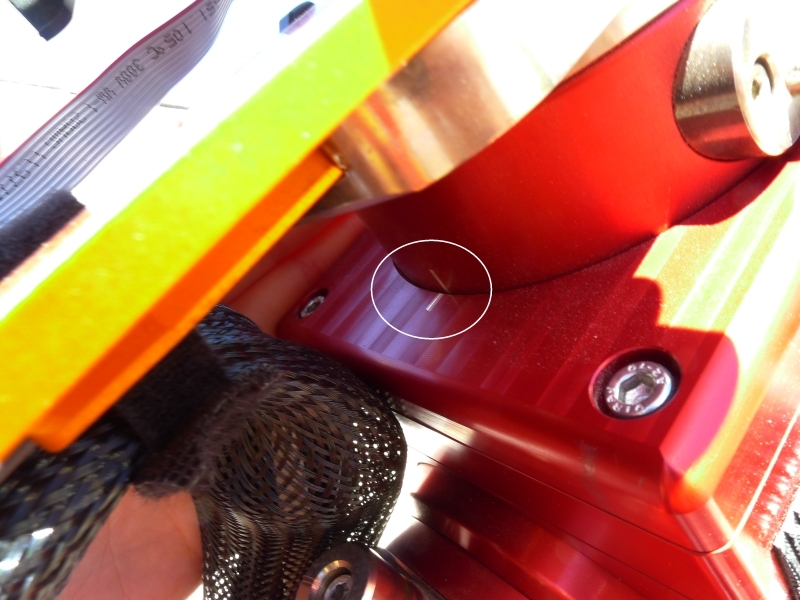 In order to do anything, you need to firstly connect the mount. 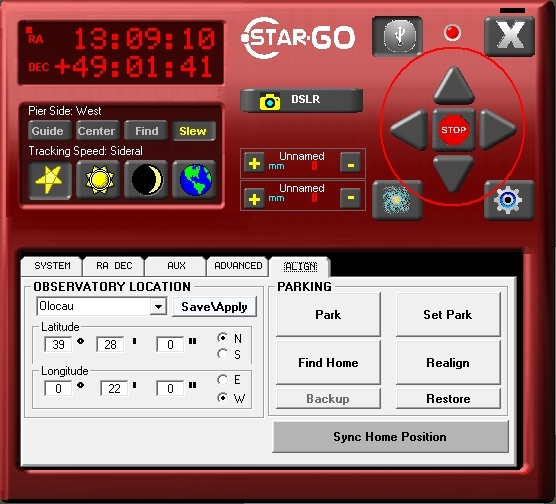 Firstly access the StarGO icon on the desktop and secondly press the connect button. 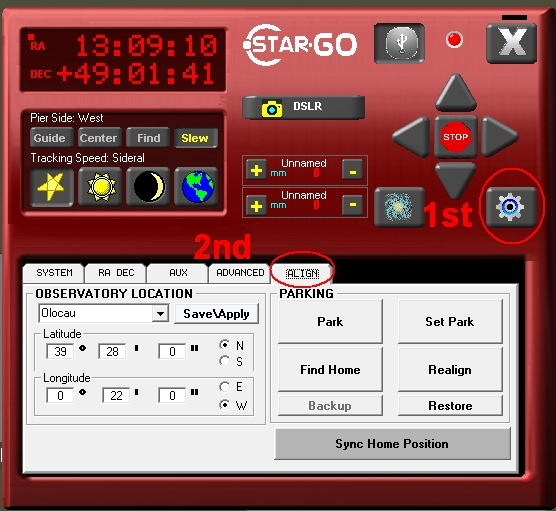 From the next StarGO screen you need to ensure that the 'slew' button is highlighted as this enables you to slew the mount freely. From this point you need to access the settings menu, which is done by pressing the 'cog' in the bottom right of the screen. 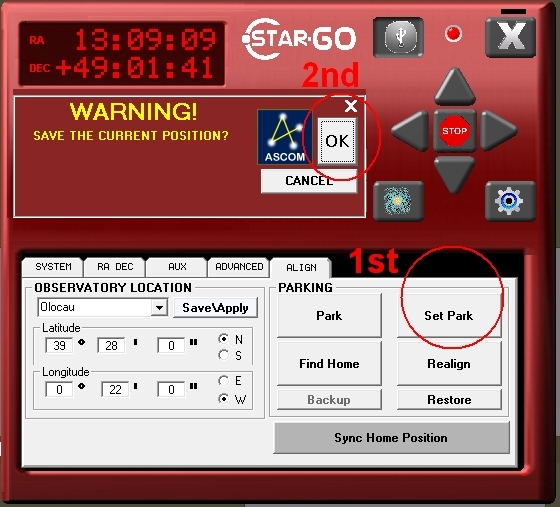 This then opens the different menus and for this exercise we need to select 'align' - Here you can see the relevant 'set park' button. You slew your mount using the arrow keys to a position that you want to set as your own custom park. It is likely to be wherever you need the telescope to be positioned so that you can close the roof or gain access to an area. It may be that if you have a couple of different scopes you need a different custom park for each. While you can not create a number of different custom parks, they are easy to set as required.